A couple nights ago, as I was sitting at my computer working away, my tea on the desk in front of me, a little insect decided continued existence flying around in circles between my desk lamp and the window was just too depressing to contemplate, and drowned itself. I only noticed it when I went to take a sip of tea and there was a black speck in it. It was tiny, and I scooped it out with the tip of one finger. The way it stuck to my finger offered a perfect profile of the bug, so I took a photo (using my left hand – a challenge) and put it up to BugGuide.net for ID. Six minutes later it was ID’d by one of the fabulously knowledgable volunteer experts who patrol the boards. (When I get good enough to actually feel confident in what I’m doing, I’ll give back by doing the same.) My guess had been midge based on the long, evenly narrow abdomen, but I was a little off. He identified it as a fungus gnat, family Sciaridae, commonly associated with potted plants. My orchids and other plants are up on my windowsill beside my desk, so this wasn’t a surprise to me. As you can tell by the fingerprint ridges, the gnat is tiny. Although I didn’t think to measure it at the time, it was no more than 2-3 mm (<1/8″). 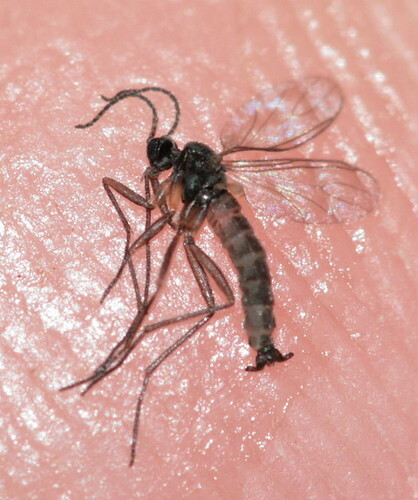 The BugGuide expert commented that to identify the gnats to species, or even to genus, requires “an extreme closeup of the tip of the front tibia from a couple angles to show fine hairs, a count of the tibial spurs on each set of legs, wing vein closeups to show hairs on some of the veins, and ideally genitalia”, so the best he could do was family. My camera, even with its fancy specialized macro lens, can’t get close enough to capture those details, so the exact identity of the critter will remain a mystery. My favourite printed bug guide, the Kaufman Guide to Insects, notes that there are some 170 species of fungus gnats in North America. Adults live only a few days so aren’t much of a nuisance as long as they stay out of one’s drinks, but the larvae develop in the “soil of overwatered houseplants”, feeding on fungi that grows in the moist environment. BugGuide.net adds decaying vegetation and potentially plant roots to the list. Hm. Maybe the plants are due for a re-potting? Although I just did the orchids in the fall. Appropriately, the KGI also comments that “These are the gnats that always seem to drown in the soap dish.” I guess it was too far to the washroom, so the tea had to do. One of the things I like about this photo is that you can see the two halteres, the yellowish nubs behind the main wings that are the vestigial second pair of wings that most other insects have but flies (order Diptera) have lost over time. The halteres (somehow) function as stabilizers as the fly flies. Wow, imagine such a tiny individual being able to coordinate all those legs and a set of wings as well! How clever! Pretty gangly-looking, eh? It’s amazing to me that things so tiny are actually alive. They’re probably amazed that things as huge as us are actually alive, I suppose. At least the gnats untimely demise allowed you to take a photograph. It was a noble sacrifice on his part. Very small indeed. I’m glad it rested “just so” for the photo. And I laughed at the comment that it was too far to the washroom! I probably wouldn’t have bothered with a photo if it weren’t for the fortuitous way it stuck to my finger, Jason. Eric Eaton, the guy who wrote the KGI, commented on my Facebook that his fungus gnats, in any case, always drown in the soap dish. He must keep his plants in the washroom, I guess.